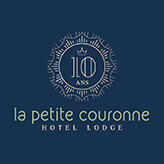 La Petite Couronne is situated in a village called Saint Cricq Chalosse. Saint Cricq Chalosse is well accessible by plane, by car and by train. There are several possibilities to come by train to Saint Cricq Chalosse, near Hagetmau. By the trainstations of Pau and Bordeaux. Visit the website of the SNCF for your search of routes. The airport of Pau is located 45 minutes from Saint Cricq Chalosse. Cityjet have flights from London City. Ryanair have flights from Pau to Londen-Stansted, Brussels and Paris. The airport of Biarritz is a litte bit more far from Saint Cricq Chalosse (1 hour and 10 minutes). The airport of Bordeaux is located 2 hours from our hotel. There are direct low cost flights from Bristol, Dublin, Edinburg, Londen Gatwick, Londen Luton, Liverpool and Manchester.